Back in March, I found myself working at a job that I was not happy doing. I barely made enough income to cover my monthly bills. What I really wanted to do was to go to college and receive an Associate’s Degree with the idea of achieving two goals: 1) to finally have a college degree and 2) to find a decent-paying job once I had my degree. So I quit my job and decided I’d do everything in my power to reach my two goals. I knew it was a big risk to quit my job without an immediate replacement, but I was determined and believed that I could somehow find a way to make extra income online so I could go to college full-time. Since I am a Veteran, I knew I could make a little amount of money each month from my Post 9/11 G.I. Bill (as a full-time student), but I still needed a job that could cover my expenses until I started college in May, as well as a way I could continue to make extra money part-time while in school. Then suddenly, I remembered watching a news report about how people have been making a decent part-time or full-time income using a website called . The basic idea behind Fiverr is that buyers pay $5 for services that a seller is providing. Services can be anything from writing short blog posts for 300 words, posting a video review, or even drawing a picture. The possibilities on what services you can offer are endless. I figured it was the best place to start. After about a week of experimenting with a few services to offer, I had made my first $100! Fiverr is a place for people to share things they’re willing to do for $5. Want to pay $5 to have a video recorded of a puppet singing “Happy Birthday” on your child’s birthday? They have that and more! Fiverr is very easy to use. After , you will have the option to “create a gig” on what you’ll do to make $5. You can include instructions to the buyer, as well as a maximum number of days they should expect you to be completed with their work. What’s great is that you have your own seller dashboard where you can review your revenues, sales, and view your due dates for gigs. And if at anytime you feel that you need a break, you can pause your gig so that you don’t receive any more orders until you activate it again. This helps give you time to catch up on your orders when you need to. How much can you make from Fiverr? 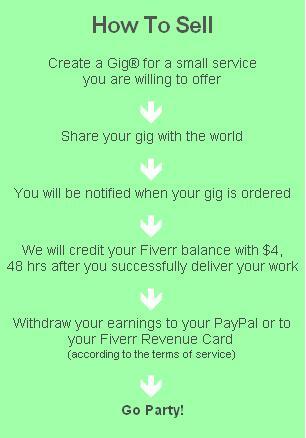 How much you can make with Fiverr really depends on what your are offering, as well as how much time you put into it. It is totally possible to earn an extra $500 or more a month, and I say this from personal experience. Sellers earn a flat $4 commission when a buyer purchases their services, and payments are made through Paypal with a minimum payout of $4. One of the first things you should look at when considering to sell your services on Fiverr is to find out what services are selling and what is popular. When I first looked started into using Fiverr, I noticed that writing articles was a popular trend that buyers were looking for. That is where I made most of my money at first. If you also have a service you feel is unique and valuable, you can offer this as a service, too! You have to remember that you are paid less than $4 once Paypal takes their fee. With this in mind, you want to provide a service that does not take much of your time. When I first offered my article-writing services, I decided to stand a part by offering article writing for 500 words since no one else was offering that service. I later realized I should have used a lower word count, since 500 words can take a while to write depending on the topic. You want to realistically spend as little time on a task so you can take on more orders. If you’re offering a service that allows you to give them something extra, do it! This will create repeat customers, and a positive review. At a certain point, you can unlock more options on Fiverr where you can offer customers added “Extras” which help make you more money. So if you are offering to write a 300-word article for $5, an extra option you can choose to include is to have an article written up to 600 words an extra $5. After working with regular clients, they started ing me to write for them off of Fiverr. For a seller, this means you make more money since Fiverr takes a commission. Note: As a seller, you are not allowed to offer your offline information to the client. Currently, I am in my second college semester aiming towards a degree in Polysomnographic Technology. I don’t need to use Fiverr to make money as much as I used to since it has helped me find clients to work with regularly offline. But I definitely recommend it as a great place to earn additional income when you need it. Lisa is a 27-year-old Army Veteran turned freelance writer, blogger, and full-time college student. She writes about living frugally, budgeting, and more over at . Think anyone would pay for a proofreader? I did a lot of that in college for students since I was an English major. I’d review their term papers and essays for gramamtical errors and offer suggestions for correction and improvement. But I don’t know if people would actually pay for something like that. I am a freelance writer, and I do quite a bit of editing/proofreading work for various clients. There is a market for this service, and in my experience people will often pay more than $5 for it! Oh ya there is a HUGE market for freelance writing, and you can def make more at it. It’s amazing to me though that people would rather pay less money for a writer. I once had a company offer me to write articles for them and only make like $0.99 for a 500 word article.. are you kidding me..
A better deal for you for proofreading might be local: If you live near a university, you can look into hanging signs, etc. to advertise proofreading. I’ve done proofreading work for graduate students who are also international students, and many are happy to pay $3 or more per page to ensure their assignments are grammatically correct and use correct English. I’ve never heard of this one. Thanks so much for sharing!!! Could you please clarify? Here you say, “Note that as a seller, you are not allowed to offer your offline information to the client,” but then later you say, “I don’t need to use Fiverr to make money as much as I used to since it has helped me find clients to work with regularly offline.” Does this mean you can do gigs for clients offline if they ask you to? Is the restriction just that you can’t advertise to do it offline? Just wanted to be clear. Thanks. I think it sounds like they can ask for it, but you can’t offer it without them asking. I could be wrong, but that’s what it sounded like to me. I read through all of the terms this morning and I’m not completely sure. I’ll ask Lisa to clarify for us. Yes, that’s exactly the case! I don’t know why, but it is that way. I’ve read on several websites posing this question, but Fiverr has not had any rules against this kind of thing yet. It could be a possibility in the future, I’m sure. However, there are many clone websites just like Fiverr out there. I have never personally used any other websites that are like Fiverr. Hopefully I can clarify some of this, as it can be confusing to understand! As a seller, you can not provide your personal information willingly (email, websites) in the Gig or in a message. However, a buyer can request offline work by providing you with their information BUT you can not request it. This is not against their rules. Fiverr will lose commissions if any person were to offer their services off of Fiverr, and does not want to lose that $1 commission. So, the answer to the question “Does this mean you can do gigs for clients offline if they ask you to?” is yes, but only if THEY provide you with their information. That’s been my exact experience where they will give me their information to take things offline. It sounds funny, but most that have offered to take business off line only want to do so in an effort for me to keep the extra $1 in commission, or just prefer to not always use Fiverr. In any event, it’s a great way to start finding consistent work where you are then able to charge more when you have more experience. That’s what I’ve been able to do so it works out great, esp for freelance writing. There are sellers that go around the rule of giving out their personal info by providing an invoice on PDF/Excel/word to deliver their service (which is unscanned by the site). I STRONGLY advise against doing that. This is a great starting point for someone that is interested in freelance writing, but please know that you can make a LOT more than $5 for writing 300 word blog posts/articles! As you become adept at writing on a particular subjects, prepare some samples and seek out private clients to work for. You can make a lot more money his way! I picked up the free kindle book on “fiverr” a while back. I haven’t read it yet but plan too. I am thinking the trick would be to come up with something you are good at and therefore can finish quickly, yet is also unique in some way. I am still brainstorming what that would be for me. I am loving this series great ideas! Thank you for your service to our Country! This is really interesting information, too! Thank you! Best of luck to you in your education and job pursuits. Thanks Nancy! It’s still funny to think that I’ve been discharged for over a year now but kind of glad I am done. I wanted to complete my degree, as well as pursue other opportunities, but it was hard to do with my field. I was an Admin, but I mostly worked for an Operations area at a Brigade which involved a lot of last minute travel. I even worked for a deploying unit, which was rough. So, I’m glad I joined for all the experiences I’ve learned, but at the same time I’m glad to now be pursuing my other goals. There are not many people in my family with a degree, so I want to take advantage of the army benefits I did receive. Thanks so much for all these great posts! Love your website. Such great ideas for all areas of our lives! I have never heard of this and I love the idea! I know this isn’t really the right article but does anyone have a free way besides craigslist to find a cleaning person. I am looking to hire someone to come every other week and am having a hard time finding someone. Anyone have a recommendation for where to find someone trustworthy? You could put an ad in the paper. Ours doesn’t charge for small things like that. You could post on Facebook that you are looking for a cleaning person. If your immediate friends aren’t interested, they may know someone who is. I’ve purchased graphics through Fiverr but have never offered work on there. I found freelance writing work at this time last year on oDesk. Again, a lot of the people that hire folks on there offer quite low pay but I managed to find a writing job that paid $13 an hour for pretty easy work. By the end of the project I cleared $1500 in about 3 months.